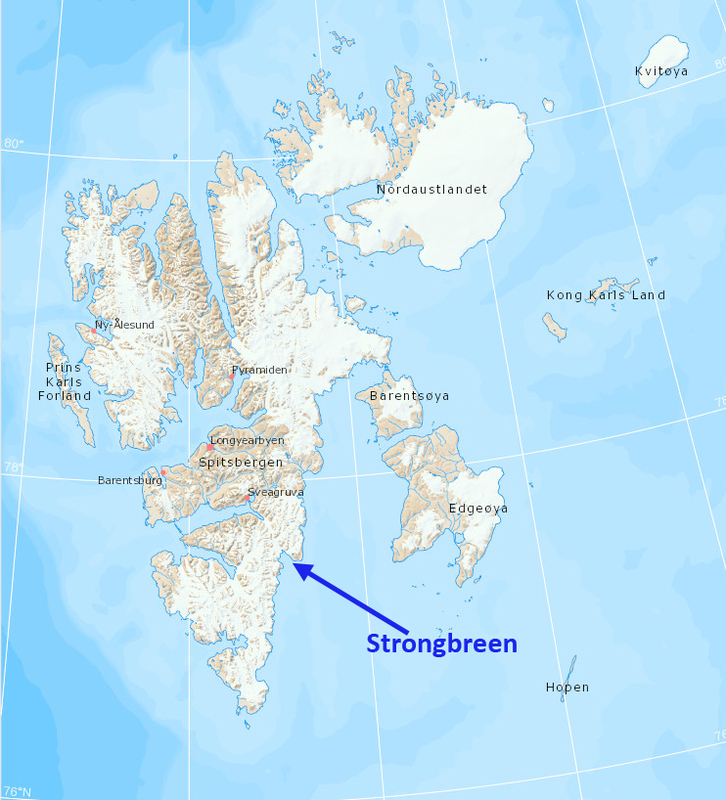 Strongbreen is a glacier in Svalbard on the southern part of Spitsbergen draining east into the Kvalvagen Fjord. Blaszczyk et al’s (2009) analysis identified 163 Svalbard glaciers that are tidewater with the total length calving ice−cliffs at 860 km for the 2001-2006 period. They observed that 14 glaciers had retreated from the ocean to the land over the last 30–40 year period. 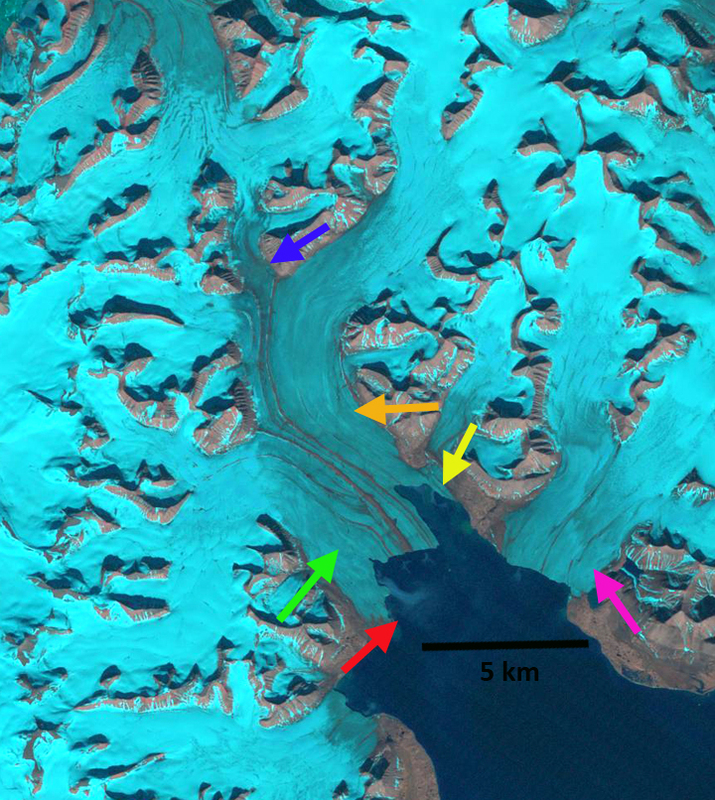 One glacier they observed having separated from neighboring glaciers was Strongbreen, which they noted was retreating at a rate of approximately 40 m/year since the previous inventory. The glacier had been connected with the Kvalbreen and Perseibreen Glacier. They also identified this as a surging glacier with the last known surge in the 1870’s. Here we examine Landsat images from 1990. 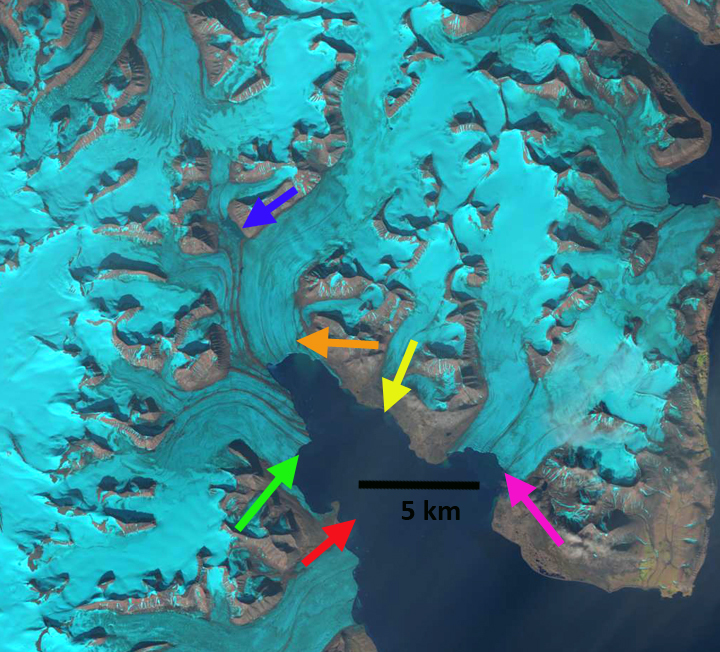 2002, 2014 and a Digital Globe image from 2010, to identify changes in the glacier over the last 25 years, the colored arrows are in the same location in each image. In 1990 the glacier extended down fjord to the red arrow and yellow arrow on the south side and north side of Kvalvagen respectively. On the southern side the terminus is at Sergievskijfjellet. Kvalbreen at the pink arrow terminates nearly parallel with the northern shore of the fjord. At the blue arrow is the glacier junction with a very small glacial dammed lake between the glacier and the adjacent mountain. By 2002 a small fjord is beginning at the pink arrow where Kvalbreen terminates. Strongbreen on the southern side of the fjord has a much narrower connection to the peninsula at the red arrow and has retreated on the north side from the yellow arrow. By 2014 the glacier has retreated to the green arrow on the southern side of the fjord from the red arrow, a distance of 3.75 km in 24 years. 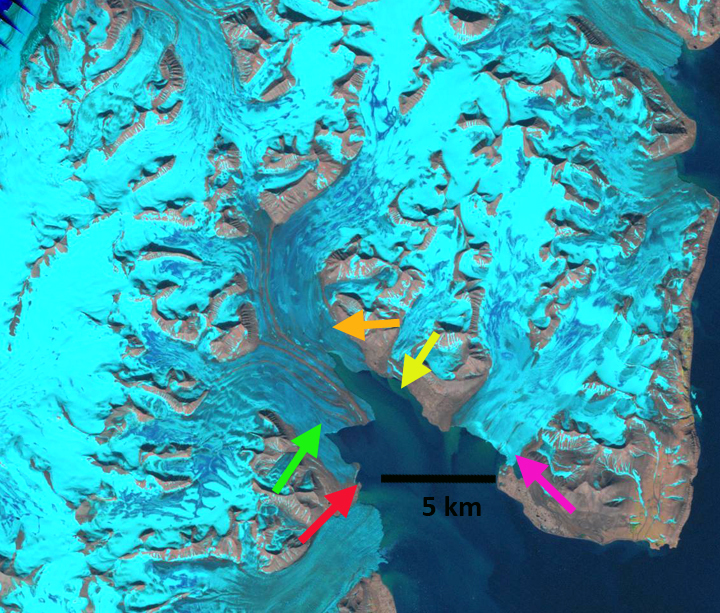 On the northern side the glacier has retreated almost to the orange arrow a similar distance of 3.5-3.8 km. This is a retreat of 150 m/year for Strongbreen quite an acceleration. 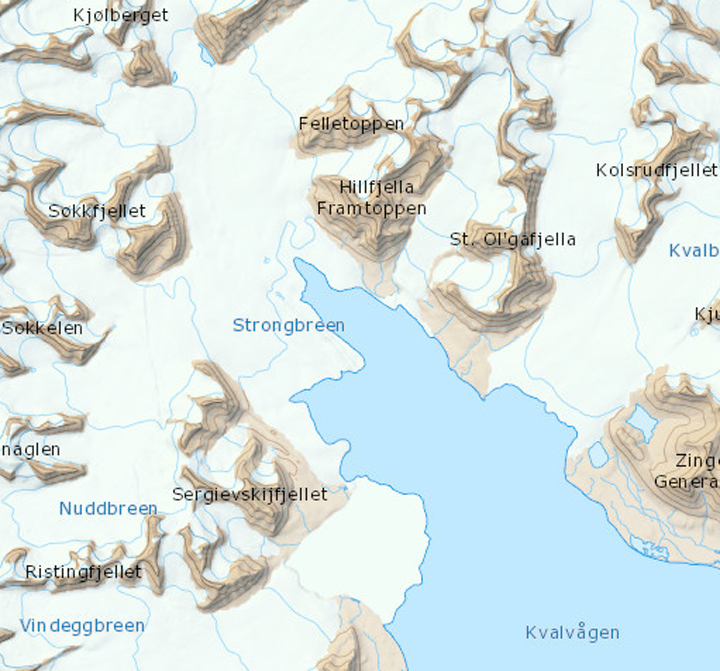 Kvalvagen has retreated 1 to 1.25 km up the newly developing fjord, a retreat of 1 km in 25 years, 40 m/year. The glacial dammed lake at the blue arrow has expanded. A better view of this lake is in the 2010 image, last one, indicating that the lake now is almost half the tributary glacier width. The expansion of this lake will lead to this tributary having a separate terminus and undermine the stability of the lower section of Strongbreen. The lower portion of the glacier is largely uncrevassed indicating quite slow velocities. Blaszczyk et al (2009) report a velocity of less than 30 m/year from 2000-2006. The low slope, limited crevassing, expanding supraglacial lake all indicate continued retreat. It then seems likely the glacier will separate into two fjords with a southern and a northern arm. The only thing that could forestall the retreat for a brief period is a surge as happended on nearby Perseibreen in 2000 (Dowdeswell and Benham, 2003). The retreat of this glacier paralells that of other glaciers in southern Svalbard: Vasilievbreen, Olsokbreen, Hornbreen and Hambergbreen. 2010 Digital Globe image posted in TopoSvalbard. 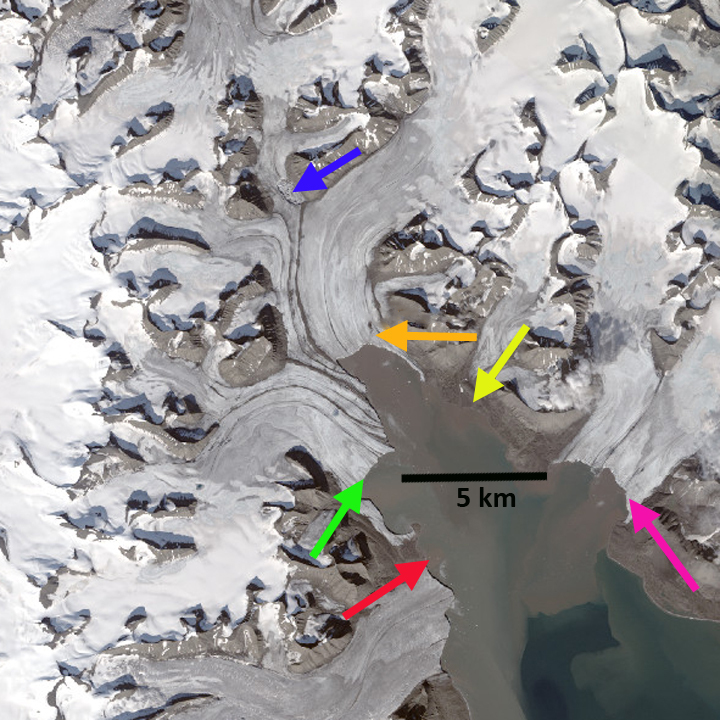 This entry was posted in Glacier Observations and tagged kvalbreen glacier retreat, spitsbergen glacier retreat, strong breen glacier retreat, strongbreen glacier retreat, svalbard galcier retreat. Bookmark the permalink.